Build a Smart Home with Alfred x Google Assistant! - New Features - Alfred Center | get the most out of the best home security app! Build a Smart Home with Alfred x Google Assistant! Rather than launching Alfred to turn Motion Detection on/off on your Cameras one by one, have you ever found yourself wishing the process could be simpler? That dream is coming true now that Alfred Android supports Google Assistant! How can I link Alfred to Google Assistant? Launch Alfred and tap the menu icon on the upper left corner. Choose Settings, and tap Google Assistant. Confirm the account to authorize access and it’s done! What can Google Assistant make Alfred do? 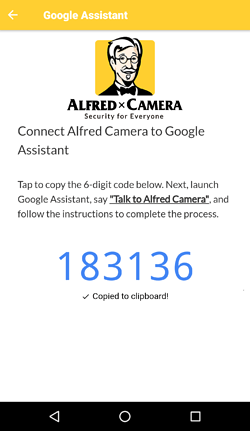 "Ask Alfred Camera to disarm Motion Detection." 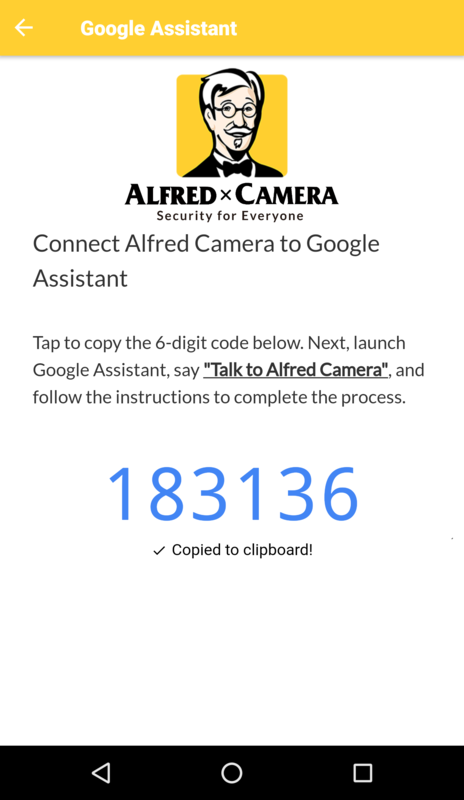 "Ask Alfred Camera to enable Motion Detection." For the moment, this feature is available for users whose device language setting is English. For us, the immediate next step is making the voice commands location-aware. This would enable you to control your Cameras based on where they are installed. Imagine a voice command like “Turn on Motion Detection for the living room” or “Disarm my garage”. Then we are considering new use cases which could maximize the potential of integrating voice control with Alfred. We do have some interesting ideas, and we will share them when they become more concrete. In the meantime, we look forward to hearing your feedback/thoughts to help us take this project to the next level. Let us know here so we can look into it! Home automation is the hottest trend in technology nowadays, and it is more accessible than ever. Everyone wants a responsive, convenient, and advanced home. Smart home is no longer a product of imagination in science fiction. In the past, the idea of building a smart home was limited to buying smart home devices from Best Buy or Walmart. Getting Chromecast, smart TV, or Philips Hue used to be where things stopped. However, with deep learning, machine learning, AI, and voice assistants such as Siri, Alexa, and Google Assistant, the possibilities are infinite! Increasingly, companies are integrating smart home technology with home security and beyond. Features such as face recognition, motion detector, or person detection are taking shape. AI-powered security system can spot intruders, make sure the gate is shut to keep children and pets safe, as well as differentiating between unusual noise in the environment. As opposed to a traditional home security system that requires installation, these self-monitoring devices are usually paired with a mobile app to fit the modern lifestyle. Privacy settings and encryption technology will ensure information security while you enjoy the protection and convenience. Wouldn’t it be great if your home security incorporates artificial intelligence to offer facial recognition and object detection algorithms? Wouldn’t it be even better if you don’t have to spend big money on it? Great news: besides Google Assistant integration, Alfred will soon make Motion Detection more powerful by incorporating some of these features! Please stay tuned! How to connect alfred to my google? Share Your Thoughts on Voice Assistant Integration! Cannot set up and link to my Google Assistant!